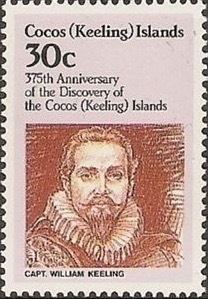 The discovery of the Cocos (or Keeling) Islands in the Indian Ocean 400 years ago is generally attributed to William Keeling, a British sea captain. Keeling kept a diary of his voyages and this includes entries from January 1609, exactly four centuries ago. Unfortunately, he made no particular record of sighting the Cocos. Another diarist and assistant to Charles Darwin aboard HMS Beagle, Syms Covington, however, did mention the islands. The Cocos, which is now a territory of Australia, consists of two low-lying atolls and twenty-seven coral islands about halfway between Australia and Sri Lanka. Keeling is thought to have been the first to discover them in 1609; but they remained uninhabited until the early part of 19th century, when private owners (the Clunies-Ross family) transported slaves there to work on coconut plantations. The islands were annexed by the British Empire in 1857, but then, in 1886, Queen Victoria granted them to the Clunies-Ross family in perpetuity. An important telegraph station on one of the islands, which provided a communication link between Britain and Australia/NZ, meant the Cocos were drawn into both World Wars. After the fall of Singapore in 1942, they were administered from Ceylon (now Sri Lanka). In 1955, their administration was passed to the Australian government, but it was not until 1978 that it obliged the Clunies-Ross family, which had still been enjoying feudal rule, to give up ownership. Today, there are about 500 inhabitants, coconuts are still their main cash crop, but tourism is becoming a significant industry. Wikipedia has more, as does the Cocos Keeling Islands website. Not much is known about William Keeling, a British sea captain. According to Wikipedia, he commanded the Susanna on the second East India Company voyage in 1604, and he commanded the Red Dragon on the third voyage of 1607. It was during this journey, while returning home from Java, that he discovered the Cocos (Keeling) Islands in 1609. Later, he was put in command of Cowes Castle, on the Isle of Wight, where he died in 1620. Keeling’s journal is contained in Volume VIII of A General History and Collection of Voyages and Travels by Robert Kerr (freely available at Project Gutenberg or Internet Archive). There is no mention of the Cocos in the journal, but here are two paragraphs from Kerr’s introduction, which explain (by reference to another set of travel writing - Astley’s Collection) how Keeling’s journal came to be rather fragmentary. ‘In this voyage three ships were employed, with about 310 men; the Dragon, admiral, Captain Keeling, who was chief commander or general; the Hector, vice-admiral, commanded by Captain William Hawkins; and the Consent, Captain David Middleton. The relation of the voyage, as appears from its title in Purchas, was written by Keeling, the chief commander or general, or, as he would now be called, the commodore: But, by a side-note, Purchas informs us, that he had abbreviated the narrative from the journals written at sea, by Captains Keeling and Hawkins, which were very voluminous, occupying a hundred sheets of paper, and that he had only retained the most necessary observations for sea and land affairs. And here are a couple of paragraphs from Kerr’s journal itself, dating from January 1609, exactly 400 years ago. They are taken from section 4 - Voyage of the Hector to Banda, with Occurrences there - and although tedious in style are also interesting for the details. ‘About one in the morning of the 1st January, 1609, we weighed anchor, and with an off-shore wind got round the east point, three leagues E.N.E. from our former anchorage. Thence easterly to another point other three leagues, a very long shoal with very little water extending between the two, to avoid which it is good to steer halfway between Java and the isles of Tonda, which are five leagues distant. East from the second point is the isle of Tanara, so close to the shore that it cannot be distinguished from any distance. From the second to the third point, are four leagues E.S.E. and one and a half mile off that point N. by W. is the isle of Lackee, between which and the point is only one and a half fathoms water, according to report. We rode all night in six fathoms, having the isle east of us a league. Weighing on the 4th, we steered within half a league of Lackee in seven or eight fathoms; from the isle to the west point of Jackatra being E.S.E. four leagues. There is a dangerous sand off the west point of Jackatra, wherefore it is good to keep nearer the island opposite that point. ‘Anchored in the Basin, Keeling or Cocos Islands April 1st, after having a heavy breeze the last two or three days of our passage. The Islands ARE all very low; the beaches appear to be the highest. AND the highest I should suppose not more than twelve to fifteen feet high; all coral, about forty in number, the largest not more than ten miles long. The islands are complete forests of cocoa nut trees; if not for THE trees, the land would be seen FROM but a very short distance. ONE can wade from one island to another when the tide is low, to nearly all except THE entrance to THE Basin, which Basin is formed by the islands being as placed to form a circle. The Basin IS about twelve miles across. ONE cannot go far in with A ship; we anchored in seven or eight fathom OF water; coral bottom with white sand, the water always being clear. Beautiful branches of coral can be seen from the ship’s side, the fish constantly passing and repassing amongst the coral, has a most beautiful effect, etc. An Englishman and HIS family, with about sixty or seventy Mulattos from the Cape of Good Hope, live on one of the islands. Captain Ross, the governor, is now absent at the Cape. Plenty of poultry (A Chinese breed) and turtles, the latter of which the ship was supplied during our stay: two per day, each about A hundred fifty pounds IN weight. Also hogs, sugar cane and bananas (the latter I never saw); tobacco, planted here, produces well. I believe the coffee plant was also tried but never saw it. THERE ARE two sorts of indigenous fruit AND plenty OF watermelon, ALSO maiz. The water is very brackish and for which one is obliged to dig wells; THE WATER LEVEL rises and falls with the tide although IT IS some distance from THE beach, and THEY WERE obliged to dig until they came to a number OF stones, under which springs the water. A lake (lagoon) IS on the largest island. In the small lagoons or pools on reefs are immense numbers of small fish of different species, and of the most brilliant colours and shapes I ever saw or fancy could paint. Here are great numbers A green fish, THE coral eater. Here also are land crabs, very curious and very strong in claws. THEY are eaten by the inhabitants. Here, I should suppose is one of the largest shells in the world, sort of clam shell, WHICH would take a very strong man to lift one with the animal in. The largest is about nine feet long. Different sorts OF SHELL AS WELL, leopard shells, etc. Great quantities of bêche-de-mer, WHICH is like A large, black English slug only about ten times the size, are dried here for the Indies. Only one genus of land bird here, viz. the land rail, indigenous to THESE islands. A great many sea birds and very tame, as to let you come close to the them or within a yard or two. THEY build their nests on the trees close to beach. On this Island were great numbers of the land rail, about several houses. The Java sparrow WAS brought here. On Sunday the 3rd of April was caught a shark eight feet long, which put a stop to our bathing, which before was at every evening by moonlight. It is excessively hot. When sitting still the sweat is constantly dropping off the body.